Only forty years ago, the gleaming metropolis of Abu Dhabi that we know today was a hungry, mud-brick speck on the edge of the desert. Most people lived as their ancestors had done, scrapping a meager living from the sea and inland oases. In 1761, a hunting party of Bedouins followed a gazelle out of the desert to a pool of fresh water near the coast, a miraculous find in that place. (Abu Dhabi means “a place with lots of gazelles.”) They built a well and a watch tower out of coral, sea stone and crushed sea shells to protect and control the water, at that time the greatest form of wealth they knew. The ruling sheikh moved into the fort and Qasr al-Hosn (which means “palace fort”) remained the residence of the local rulers for 200 years there after. Today, Qasr al-Hosn still stands, the cornerstone of Abu Dhabi, now in the shadow of glass and steel skyscrapers, watch towers of another kind built by liquid wealth of another kind. A settlement grew up around the fort and pearling, fishing and trading industries developed. Piracy also developed and the coast around Abu Dhabi became known as the Pirate Coast by the British, who were passing by regularly on their way to and from India. In the 19th century, the pirate problem led to a series of treaties or truces between the British and area sheikhs. Hence the next British name for the area – Trucial Coast. British influence lasted until 1971. Some contend that the British used piracy as a pretext to get a foothold in the Arabian Gulf ahead of other European powers. The pearl harvest and trade made Abu Dhabi economically vital through the 19th century and into the 20th. The development of cultured pearls in the 1920s and the global depression of the 1930s all but ended the natural pearl industry, leaving Abu Dhabi pretty much destitute. They fished, grew dates and herded camels and got by, barely. Then came oil. Oil was discovered in Abu Dhabi in 1958 and exports began in 1962. In 1966, Sheikh Zayed bin Sultan Al Nahyan sent his older brother Shakhbut into exile and took control. Shakhbut was stuck in the past and making no real effort to put his new wealth to good use. It was a bloodless coup. Sheikh Zayed began right away to invest the new oil wealth in Abu Dhabi and to share it with his neighbors. He built roads, an airport, schools, hospitals, all the infrastructure that a society needs to prosper and progress. In December 1971, Abu Dhabi joined with five other emirates – Ajman, Dubai, Fujairah, Sharjah, Umm al-Quwain – to form the United Arab Emirates. The seventh emirate, Ras al-Khaimah, joined in February of 1972. Abu Dhabi became the capital of the UAE and Sheikh Zayed bin Sultan Al Nahyan its first president. 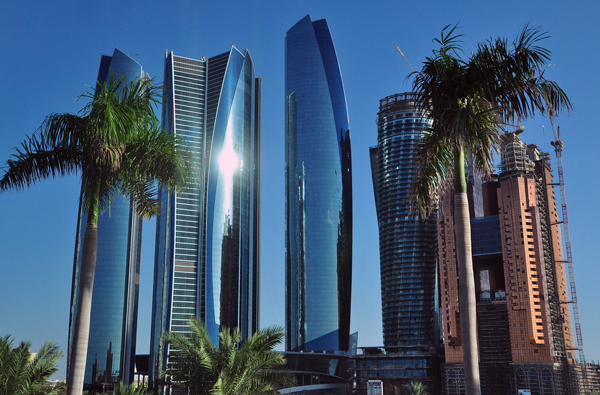 Since independence, and oil, Abu Dhabi has become an economic powerhouse, with a per capita GDP in line with countries like Germany, France and the UK. Besides crude oil, natural gas contributes significantly to Abu Dhabi’s wealth and the emirate is actively working to diversify its economy, with steady growth in real estate, banking, tourism and manufacturing. The UAE as a whole is listed in the Very High category of the Human Development Index, which tracks life expectancy, literacy, education, standards of living and quality of life. Click to see tours of Abu Dhabi on our web site. The leaning tower pictured above is known as Capital Gate. 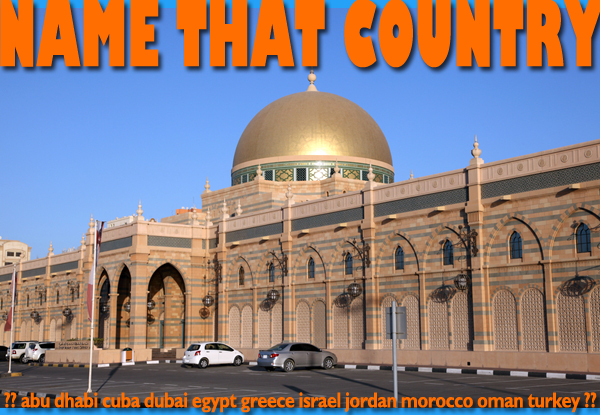 It is located in the capital city of the United Arab Emirates, aka UAE, and is the center piece of the National Exposition Center. 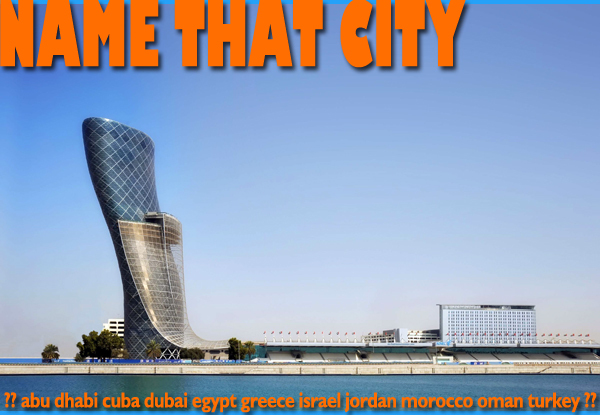 With an 18-degree lean to the west (more than 4 times the lean of the tower at Pisa), Capital Gate holds the current record as the leaningest of leaning towers. Unlike the Pisa tower, this one leans on purpose. A number of innovative engineering measures assure that the building will not topple, among which is its pre-cambered core, which means the concrete core was built to lean in the opposite direction of the completed building. The tension between the core and the outer structure provides stability. The tower’s 35 levels are occupied by offices on the lower floors and the Hyatt hotel in the upper floors. The asymmetry of the building means every room has a unique shape. The exterior of the building is covered in 12,500 panes of glass, each of which is a different size. The Museum of Islamic Civilization pictured above is in Sharjah, about a 30 minute drive from fellow emirate, Dubai. Housed in the historical Souq Al Majarrah building, the museum’s extensive permanent collection is exhibited in sections on religion, science and technology, and 4 galleries of Islamic art. Falconry is a centuries-old tradition in our mystery city, and in the wider region. Trained falcons are used to hunt small animals for their keepers. 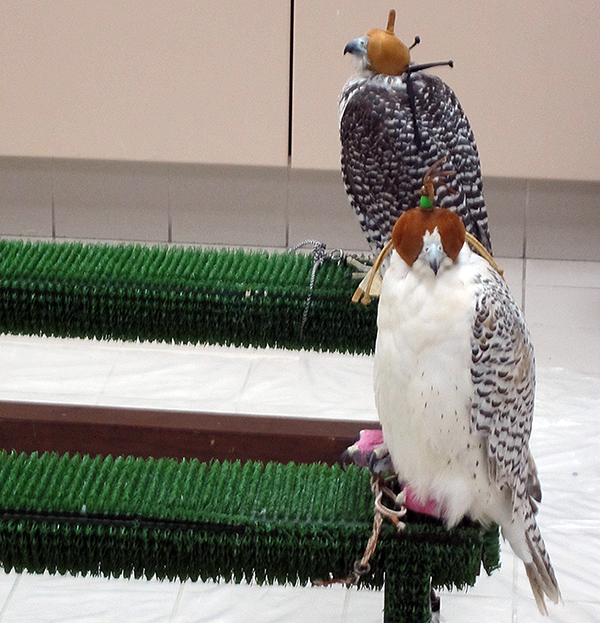 Today it’s a popular sport but some Bedouins still use falcons to put food on the table. 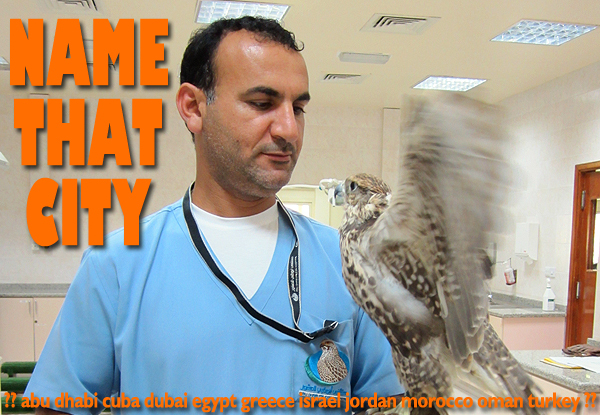 Pampered falcons visit the renowned falcon hospital in our mystery city for a check-up and a bit of grooming. Tourists are welcome to visit the falcon hospital. It’s an oryx! 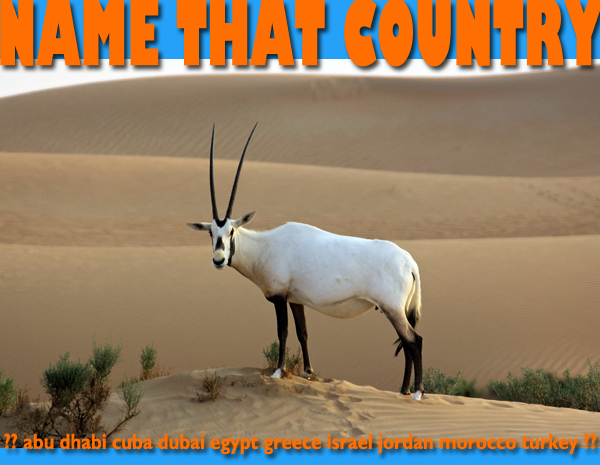 You can see one or many, along with gazelles and other creatures that inhabit the Arabian Desert. 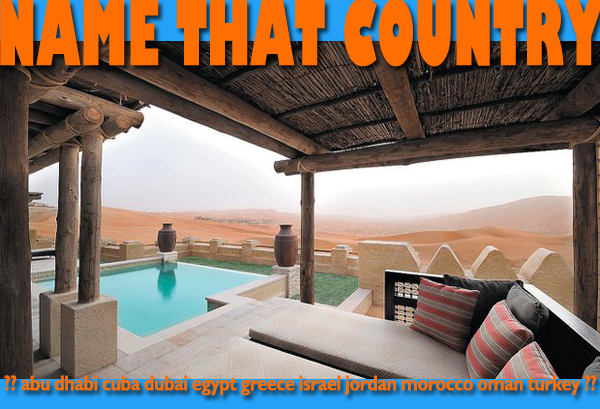 Luxury desert resorts offer nature treks into the dunes to view wildlife. Sometimes, curious animals come right onto resort grounds.